Meenmutty falls, dazzling with spectacular natural landscape is an important tourist destination in Wayanad. It is the biggest waterfall in Wayanad and the second biggest waterfall in Kerala. Superb flora and fauna present in Meenmutty falls attracts lots of tourists. It is one of the best places for trekking. Meenmutty falls, dazzling with beautiful natural landscape is one among the most exotic tourist spots in Kerala. This alluring tourist place is located at a distance 29 kms away from Kalpetta in Wayanad district. Spellbinding flora and fauna seen around Meenmutty falls presents a real feast for viewer's eyes. It is a spectacular place for enjoying the scenic beauty of Wayanad district. 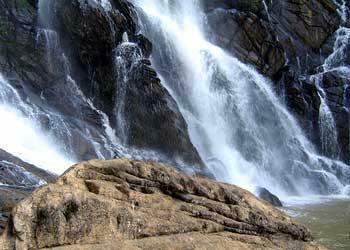 Meenmutty falls is considered as the biggest waterfalls present in Wayanad district and beholds a height of about 300m. It is the second largest waterfalls present in Kerala and had attracted thousands of tourists. Name 'Meenmutty' literally means blocking of fishes. To enjoy the fabulous beauty of meenmutty Falls, you need to trek for two to three kilometers. On the way to Meenmutty Falls, tourists can watch ancient caves made during neolithic age period. This three tiered waterfalls located in Wayanad district is a fine example depicting the gorgeous beauty of God's own country. It is only 2km away from Ooty main road and the path leading way to Meenmutty falls is quite dangerous. If you want to enjoy the view of three tiers, you need to have a separate hike through thick deciduous forest. Meenmutty falls is one among the favourite destinations of ardent lovers of trekking. Before trekking, tourists are advised to put lemon on their legs so as to prevent the biting of leeches. Meenmutty waterfalls is opened for tourists from morning 8'o clock to evening 5'o clock. There is no need to pay entrance fee for viewing Meenmutty waterfalls.